Pinner, Middlesex, Woodhall Gate circa 1930. Woodhall Gate is the road off to the left, the photographer is actually in Uxbridge Road. 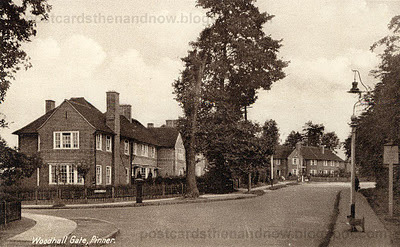 Not a very exciting postcard, but I was born in Woodhall Gate on October 6th, some years ago (can't quite remember how many), so the postcard holds considerable interest for me. The postcard was published by an uncredited publisher. Click to enlarge. Trees have gone or changed, the hedge at the house on the corner is either new or has grown a lot. Road markings and a road island have appeared. At least a post box has stayed. But does it look the same to you?